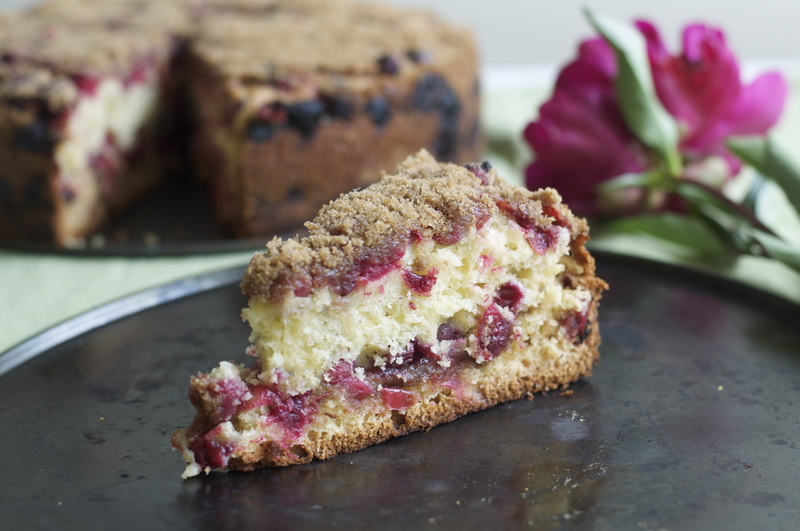 This cake is a tasty balance of sweet streusel and sour fruit. It makes quite a large treat and so is typically only served around here when company is expected. My 4-year-old was severely disappointed (read: threw a not-so-charming tantrum) upon discovering that there were no chocolate chips involved, but I think this recipe is perfect nevertheless. Cream soft butter and granulated sugar. Beat in eggs followed by vanilla. Sift together flour, baking powder, baking soda, and salt. Add to creamed mixture alternately with sour cream. Make streusel by cutting the ingredients together (or using fingers to blend the ingredients). Spread half of batter in a greased and floured 10” springform pan by dropping dessert spoons of batter evenly across the bottom and joining them with a spoon or spatula to make a continuous surface. Sprinkle with half of the streusel mixture, then half of the cranberries. Spread the remaining batter, using the spoon drop technique, then finish with remaining cranberries and then streusel. Bake at 350F for 1 hour.